The Russian tundra is one of the most inhospitable natural zones on the planet. The winter temperatures here drop to minus fifty degrees and the local population – Nenets – live in accordance with the traditions of their ancestors. If you have resolvedly decided to spend your vacation here, a bit of advice shan’t hurt. 1) Build yourself a “chum.” If you are a man, you can bravely ignore this point because you will not have to engage in building after all. According to ancient Nenets tradition, everything related to the home is women’s work – including home construction. The oldest among the women must manage the process. First excavate a large circle. Do not be surprised if under the snow you find more snow, and under that a thick layer of ice. You are in the permafrost zone, which means that for the next few days there will even be snow under your bed – it melts very slowly. Place a small oven in the center of the circle. Then drive long poles into the snow, tying them together at the top. And the conical frame of the chum is ready. Do not overdo it: if you embed the poles too deeply then they will sink down under the weight of the snow and life in the chum will be uncomfortable due to the resultant low ceiling. If, however, you do the opposite and fail to embed them deeply enough, your home will simply blow away with the wind. Pull a tarpaulin and cover of reindeer skins over the frame. These walls will protect you from even the strongest winds. Cover the floor with boards and skins. Your apartments are ready. 2) Learn how to enter the chum. Upon entering the chum, make a rotation around your axis. First, this is tradition and, second, it seems to be the only method of avoiding getting lost in the skin hanging over the doorway. 3) Get used to sleeping in the open air. In the chum, people sleep directly on a deerskin floor. The stove is stoked up in the evening, but by morning it cools off and the air in the chum is just a wee warmer than outside. So it is best to arm yourself with a winter sleeping bag. In it you will sleep exceedingly well and feel fully recharged after only a few hours. 4) Make friends with the neighbors. Surviving in the tundra on your lonesome is very difficult. Thus reindeer herders’ camps usually consist of several chums. Their masters are generally friendly but, all the same, you would do well to observe a few simple rules if you plan to visit a neighbouring chum. First, stay to the right as this is the guest half. The overall space of the chum is divided into two parts. The master of the chum lives on the side to the left of the entrance with his wife and children. Guests occupy the right side. Second, if you still want to cross over to the “host’s half,” then do so on the side near the entrance. The part of the chum directly opposite the entrance is a sacred place for the Nenets, and passing that way is not recommended. As a gift, you may offer, for example, a fruit – an orange or apple. They will be very appreciative as there are no vegetables or fruits on the tundra. 5) Set up your connection to the world. Telephone connections are not so great in the tundra. Therefore, in order to hear anything at all, it is necessary to clamber up a sled piled high with loaded sacks, stand on them as high as you can and scream into the phone, telling them to speak louder. You can charge your phone from the generator. Practically all reindeer herders have them now. In a few chums there are even televisions and laptops – without internet. 6) Drink tea five times a day. The Nenets call every meal “drinking tea.” A bottle of vodka and snacks are placed on the table with the tea. The snacks are 99% reindeer meat. Prepare yourself to drink tea and eat venison four or five times a day. But not only will you not get sick of this, but closer to evening you will find yourself dreaming of the sixth time because from early morning to late at night you have to work out in the freezing cold. On holidays sliced mucus fish and jam of blueberries and cranberries appear on the table. You will also have to get used to the absence of dishes. It is a pain to haul them around on constant journeys (reindeer herders migrate across the tundra with the herd), so everything is eaten from one or a few common plates. 7) Let nothing surprise you. Each Nenets teatime is accompanied by intimate conversations during the course of which it is possible to hear absolutely unbelievable things. For example, you may be told how to operate the northern lights with the help of a green glass bottle. Do not be surprised. Likewise, it is better not to try to reeducate the local kids. If you see a small child walking barefoot in the snow in a thirty-degree frost, there is no use falling into a swoon or yelling and getting all indignant at the carelessness of the parents. They will not understand you… Remember that the parents themselves once ran barefoot in the snow and see nothing terrible about it. 8) Learn to distinguish between reindeer. When a Nenets child cuts his first tooth, he is given a reindeer. Reindeer are also given as gifts on special days. For example, a grandmother may give her grandchild one on his birthday or at the end of the school year. In this way, the child builds up his capital – in deer – until he is eighteen. The little deer are kept closer to the chum but are united with the herd when they mature. There are several thousand deer in a herd but each herder can pick out his own among them. “Oh, that white one; that’s my Thunder! And do you see that one with the horns? They gave it to me at my wedding!” It should be noted here that there are horns on almost every deer (see point 9) and they run so fast that making out a brand or other identifying mark is practically impossible. Try, however. Perhaps you will succeed. 9) Saw horns. This is not a joke. The sawing of a horn on time may save your life. Prior to putting deer into harnesses, one of their horns is carefully sawed off so that it is harder for them to injure the driver. The second horn is left so that the deer can survive in the herd, defending itself in clashes with rivals. After some time the horn grows back completely and it has to be sawed off again. Not all deer have a horn sawed off, only the ones selected for sleds (in the tundra they are called “bulls”). The rest can continue to show off for a while. 10) Fall in love with the tundra. 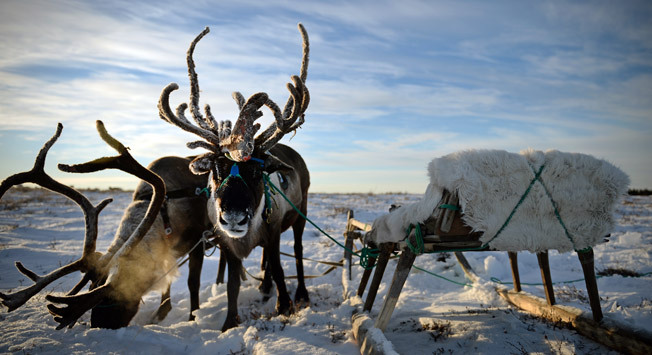 Reindeer herders cannot imagine life away from the tundra and are proud that they live there. Many, having lived in the city, return to the chum and deer notwithstanding the lack of comfort and laborious daily work. In order to survive in these harsh places, it is truly necessary to love them.